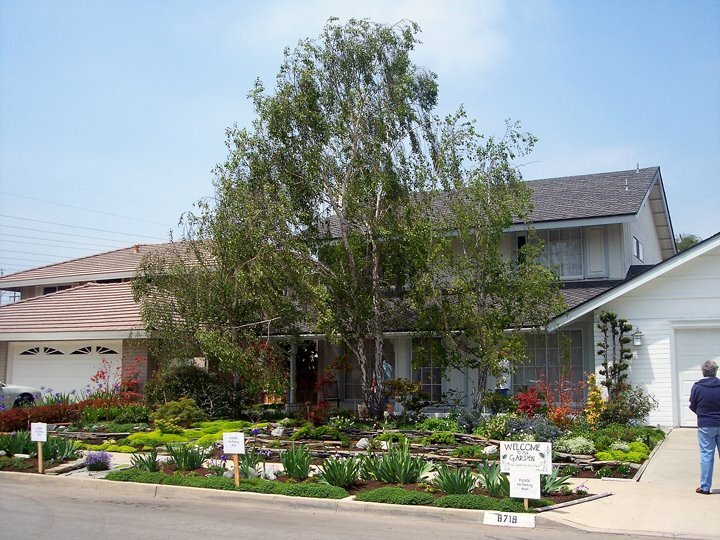 The Mary Lou Heard Memorial Garden Tour is an annual Southern California garden tour which is made up of exhibitors that are Real Gardeners. Jan and I visited eleven out of 25 gardens on the self-guided tour today. 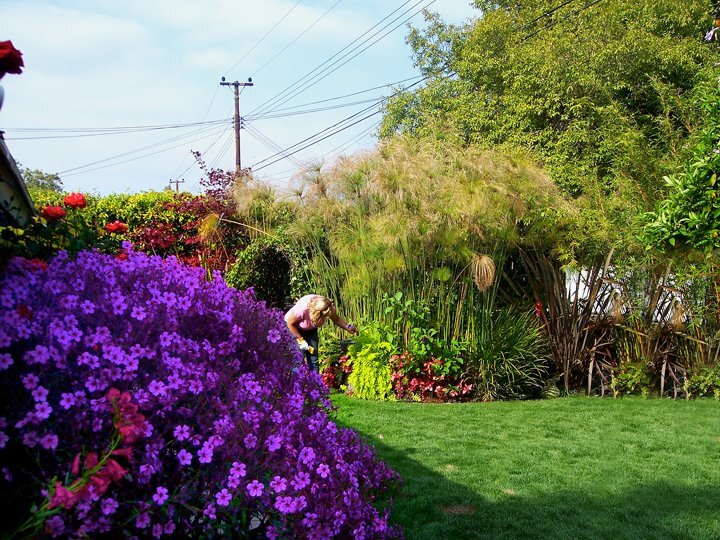 We had hoped to visit gardens in Old Towne Orange and Long Beach, but we ran out of time. One garden in San Juan Capistrano boasted a 350-400 year old oak tree, which we didn't get to see, as it was too far away. As it was, we started on the garden tour around 11 a.m. and kept going until 5 p.m. We didn't even get to stop and eat lunch; we had to eat Del Taco in the car! As you can see, the gardens were lovely, so I took lots of photos—90 pictures to be exact! Unfortunately, my digital camera settings are not the best, so I am trying to color correct each photo in Photoshop in order to bring out the proper contrast and colors. I hope you enjoy my photos. 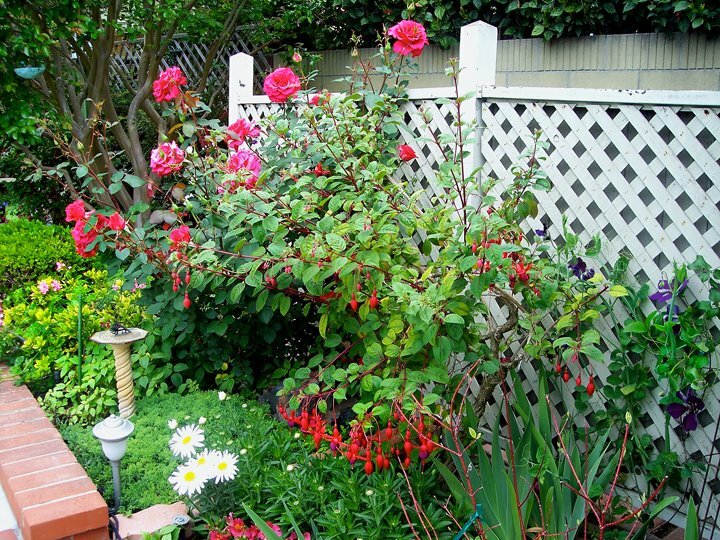 Be sure to click on each of the photos to enlarge them; you'll be sure to enjoy the gardens that much more. 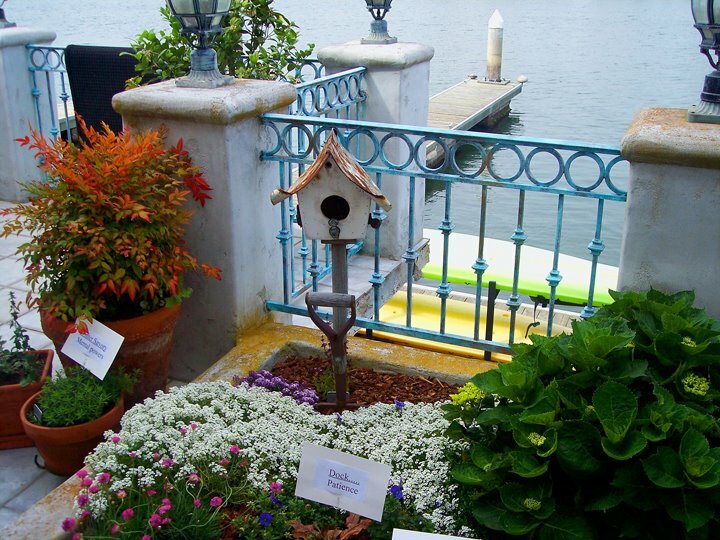 I'd describe the gardens on the tour as cottage-style gardens with lots of whimsy and water fountains. 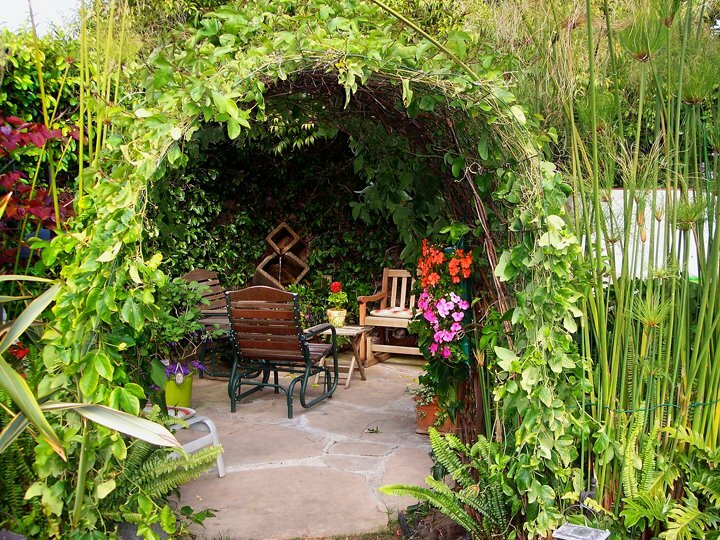 Some had secret garden rooms. 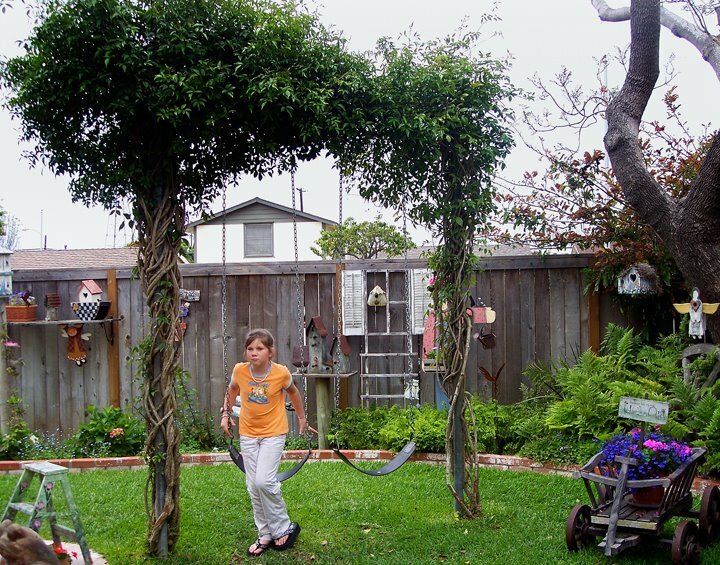 This back yard garden in Fountain Valley has swings for their grandchildren covered with bower vines, which was a lovely touch, while the English garden-style plants are designed to attract birds and butterflies. 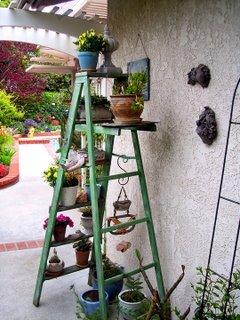 The ladder being used as a plant stand doesn't take up much space so can be used to great effect in this small side yard. Seeing this painted ladder gave me an idea for my parents' old ladder. I have left over exterior paint - maybe I'll paint the old ladder and use it as a plant stand! I have lots of potted cacti that I must put up and out of the way, since I have Miz Pup now and have to keep her out of harm's way. However, now that I think about it, all of the cacti are pretty big, so will have to get another Baker's Rack to hold them instead, I'm afraid! But I may try this idea anyway and put small pots on it. 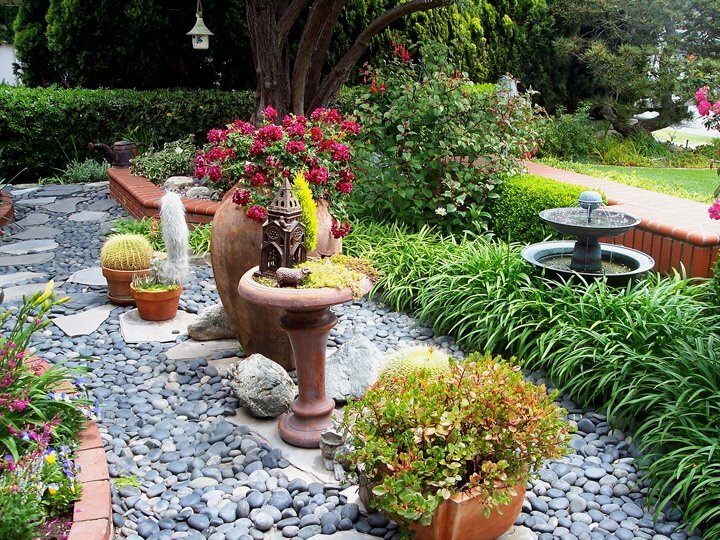 The gardener, Virginia Sheen, has this to say about her garden in the newsletter, "There is serenity in this yard that comes from the water and the trees .... The yard is anchored by magnolia, redbud and crepe myrtle trees. 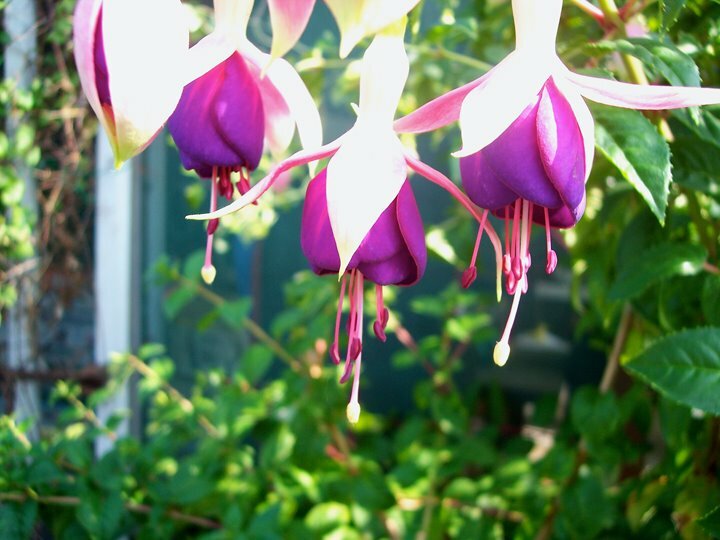 They all bloom at a different time of year to provide us with beautiful color." 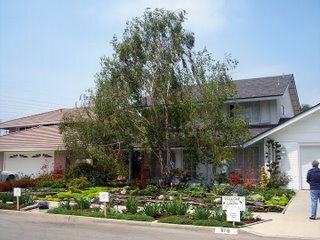 This is the Radecki residence and in their own words, "A mixture of roses, daylilies, perennials and annuals brighten the front garden of our home, which is anchored by mature trees, a crepe myrtle grown from seed, and a large potted plumeria." I liked the stonework at the Delange's home used to create terraces in both the front and the back yard. 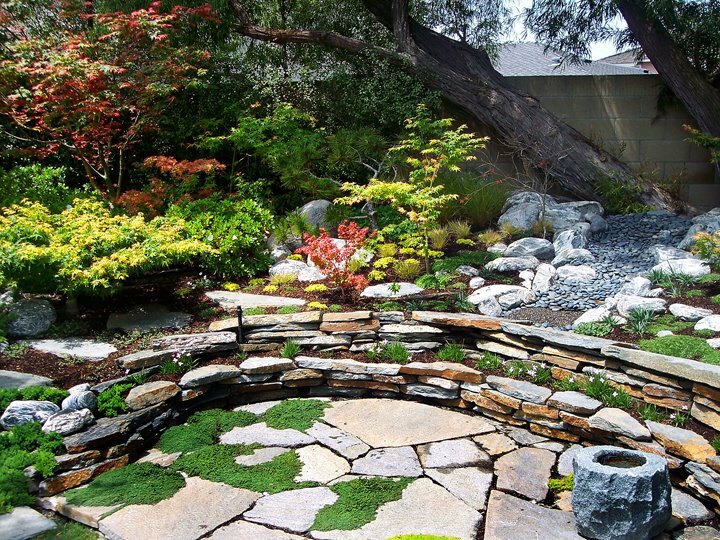 In the gardener's own words: "The Challenge: Creating a did-it-all-ourselves Japanese woodland garden in a desert climate. The Result? : You be the judge." "The garden is now some thirty-five years growing. It’s undergone several incarnations. The hardscape is notable for its water elements and some 300 run feet of unmortared flagstone walls hand laid by the gardener herself. 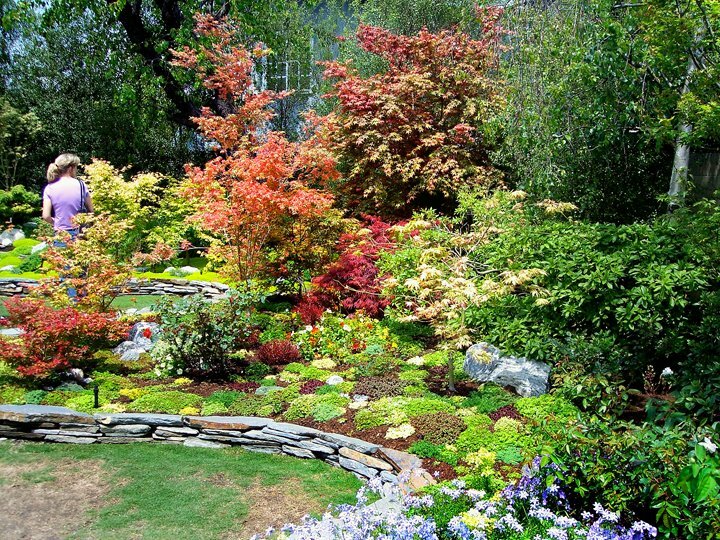 Those flagstone terraced beds are home to some fifty Japanese maple cultivars. Given that it doesn’t chill enough here for fall color, the maples were selected for their new leaf colors. If you’ve never seen a collection of acer palmatum cultivars leafing out in all their springtime glory, now’s your chance." "Some of the highpoints include a sedum tapestry bed (think the botanical version of a watercolor quilt), a leaning tree of pear, a mini and dwarf conifer tapestry (sort of like Alice in Coniferland miniaturization), and a Schefflera." This Huntington Harbour home had a pool in the front yard and the channel for its back yard. When you first enter the enclosed front garden, the first thing you become aware of is the wonderful scent that fills the air. The owner also likes to fashion tussie mussies (beautiful nosegays), which she had for sale. I'm not sure where I took this photo, but this close-up came out just right. Isn't it beautiful? Actually, I think the photo was taken at Mary Blagg's home where she has over 92 rose bushes and 8 climbers. She also uses an old ladder as a plant stand; however, hers isn't painted. The gardener of this lovely Rossmoor home, Cindi Samuelson, states, "Our very active family (three boy children and two young Australian Shepards) makes low maintenance a must! 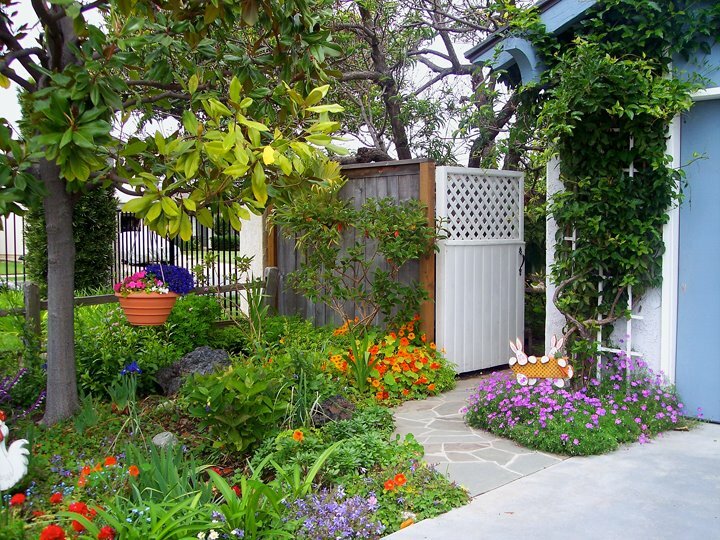 I use perennials and foliage contrasts, both color and texture, to create interest. And just in case you wonder, yes, I am the Real Gardener here. Did it all! The front garden carries a mountain theme, with 15-year-old Liquidambar trees, a meandering rock river and a colorful display of perennials and annuals. But the back garden is my baby, our own Tropical Paradise. The fifteen year old creeping fig “wall”, huge Orange tree with trumpeter vines, and bougainvillea create privacy while a large crepe myrtle shades several tree ferns, variegated ginger, agapanthus, hosta, bromelia, purple flax, nandina and bloodleaf. And don’t miss the cutting garden!" "But the focal point, and by far the most popular, is the secluded “sanctuary” approached via a sandstone path and through an arbor covered by two passion flower vines. Inside the sanctuary is seating around a fountain, a lounge chair for reading, and a spa, cleverly concealed by a privacy screen of Egyptian papyrus grass and bamboo. Take a moment to sit, breathe deeply, and – ahhh, share our bliss." 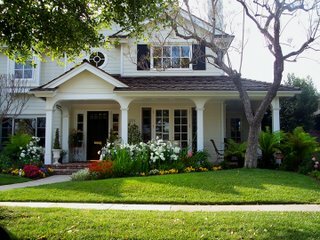 This Rossmoor house was not even on the garden tour, but it was so nice, that I had to take this picture out of the car window anyway! 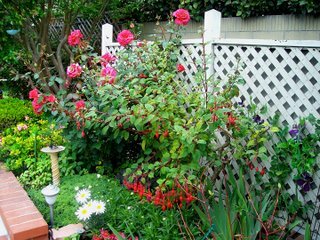 • No matter how sincerely your neighbor says "help yourself" to his prize roses, it is not polite to dig them up after dark and plant them in your own garden. • If a guest's bratty kid is stomping on your prize perennials while his parents look on passively, it is considered rude to pull up a stout plant stake and render him unconscious. Very pretty gardens! Really appreciate all the hard work you put into your blog. What a wonderful look into the gardens for all of us to enjoy. Hope you are there for the MLHT future gardens for the years to come. Thank you for sharing!